You can now enjoy a day at the race on a set of slot reels. 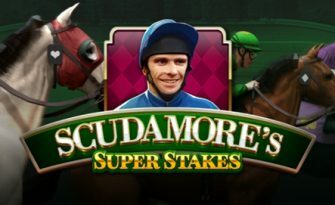 NetEnt has created with Scudamore’s Super Stakes their first ever sports-branded video slot and as expected it is all about horse races and the legendary eight-time champion Peter Scudamore, MBE. 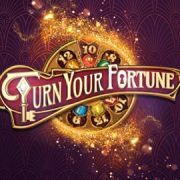 You’ll see random horseshoe wilds, a Bet Slip side game and Peter’s Classic Cup free spins with an expanded game window. Place your bet on the right horse and you could win in excess of 5,000 times your stake. Open the game to find yourself in the midst of a typical horse racing track where Peter won his trophies. The entire game design is race-themed with the track in the background and riders populating reels. A classical piece accompanies horse galloping sounds when the reels spin, while Peter’s voice commentates on the main events. Very fittingly, a bet slip can be seen on the right, which will activate the side game. 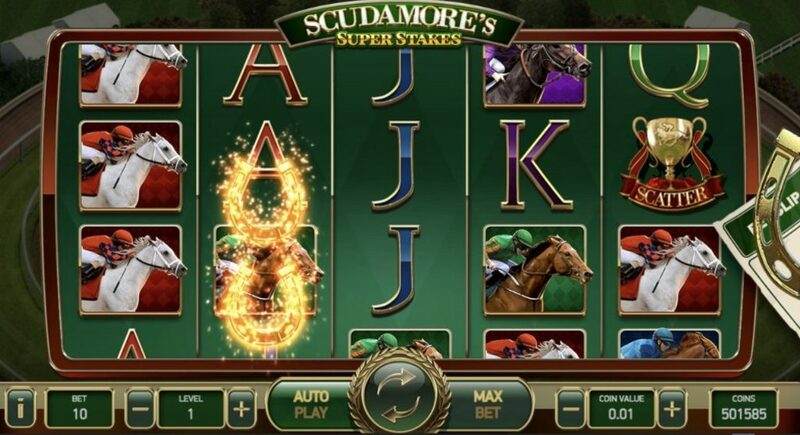 Scudamore’s Super Stakes is a video slot with five reels, three rows and 20 fixed pay lines, featuring wild substitutions, random wilds, the Bet Slip side game and Peter’s Classic Cup free spins which are played on a 5×4 reel set with 32 fixed pay lines. 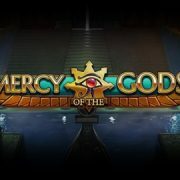 The RTP of this medium to high variance game is set at 96.11%. 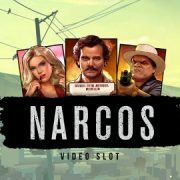 Play the slot on mobile or desktop from 0.10 to 100 coins. Pays for a single five of a kind range from 2x to 100x bet. 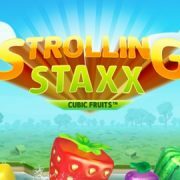 The maximum win in a single bonus round exceed 5,000x your stake. Using Autoplay will allow you to set up 10 to 1,000 consecutive spins. 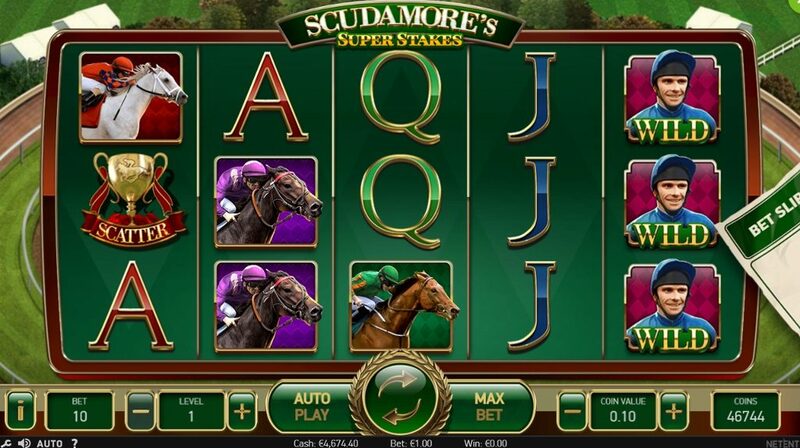 The Scudamore’s Super Stakes slot has eight regular, one wild and one scatter symbol. Each low-value symbol is marked with a colour that corresponds to a high-value symbol, which will play a big role in the bonus round. All pay symbols, including the wild, can appear fully stacked. At the low end are the playing cards – blue J, green Q, purple K and red A – followed by four horse racers with blue, green, purple and red jerseys. Peter Scudamore himself is the wild symbol while a racing trophy acts as the scatter symbol. Random wilds can trigger at the start of any spin in the base game. 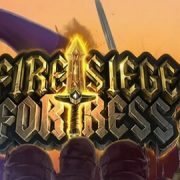 Two to five horseshoe symbols are randomly placed on the reels, turning the symbols they land on into wilds and thus providing extra win potential. 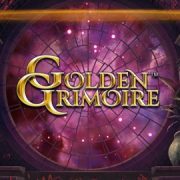 Expect it to trigger on average every 40 to 50 spins. However, the wins won’t be the huge mega hit but they can easily be in the medium range. 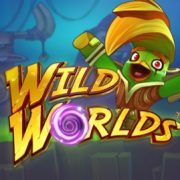 Scoring five wilds on a pay line awards 100x the bet. Fancy a little side punt while spinning the reels? 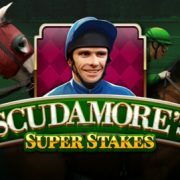 Then click on the Bet Slip to create your own bet on the Scudamore’s Super Stakes slot. First, select one of the eight regular or the wild symbol to collect, followed by the amount of symbols you predict will appear on the reels in a set amount of spins, e.g 15 As in 20 spins. 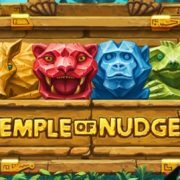 The higher the number of symbols to collect, the higher the returns but also the lower the odds that a player can win the bet. The potential win from a bet slip exceeds 1,000x your stake. The last step is to select the bet amount you want stake for the chosen bet, which will deducted once from your balance. Just like in real life, the bet cannot be changed once the slip has been purchased. 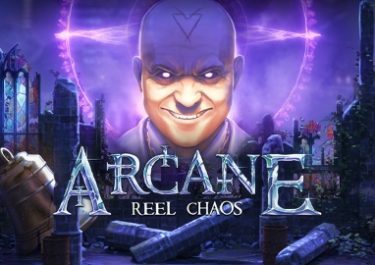 The bet is won when the predicted number of the selected symbol appears anywhere on the reels within the set amount of spins and the prize indicated on the bet slip is paid. Get ready for the main event of the day where you can win in excess of 5,000x your bet if your chosen horse wins the race. 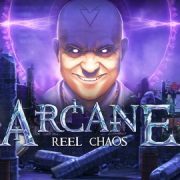 Scatters on reels one, three and five in one spin will trigger the feature with unlimited free spins. The round is played on an expanded 5×4 reel set with 32 fixed pay lines. The game leads to a second screen where you are presented with four horses and jockeys wearing the coloured jerseys as mentioned earlier. Each horse will have a bet multiplier associated if it wins the race. Once a selection is made, the game extends to the 5×4 format and the race is started. Each horse has two pay symbols associated that appear on the slot reels above the racetrack and are in the same colour as the outfit of the jockey. To see Divine Fortune advance you need to hit wins with the red jockey and red A symbols. Winning the race will pay 5,000x the bet. In turn, for Berry Max you will need wins with the purple jockey and purple K symbol, while the award is 500x the bet. The third horse is Gonzo’s Quest and you will need to score wins with the green jockey and/or green Q symbols. Finish the race in first place to win 100x the bet. The fourth horse is Tin Foil Hat: Blue jockey and blue J symbols – pays 50 X the bet. Hitting a win on a free spin will see the horse associated with the colour advance by one spot. For example, scoring a win of three purple Ks will see Berry Max progressing. Multi-line wins do not advance a horse faster. In the Race Position box on the right of the game window, the horse you have picked is marked by a star and you can follow which horse is in the lead. The free spins continue until one horse has advanced four steps. 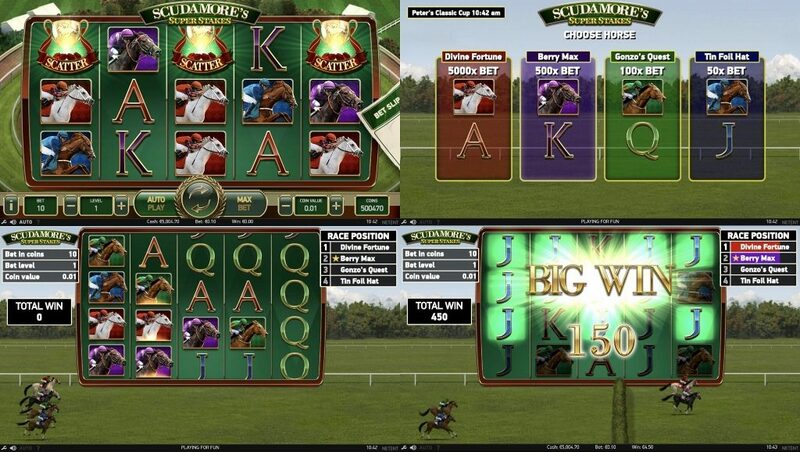 Players will collect the prize money if their selected horse has won the race. In any other case, only the accumulated lines wins from the round are paid out and the game window is returned to the 5×3 default setting. 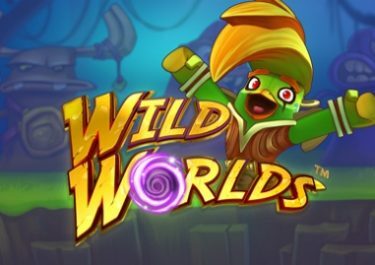 The random wilds and Bet Slip features cannot be activated during the bonus round. Has Netent done justice to the legendary horse jockey on the Scudamore’s Super Stakes slot? The unmatched champion had an extremely successful career and looks back to winning the National Hunt championship an incredible eight times. 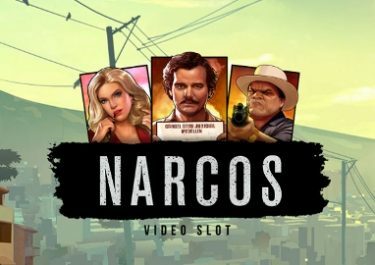 Overall, NetEnt has done a superb job to bring the race track atmosphere to a set of slot reels with the bonus features presenting an authentic event on a day at the races. 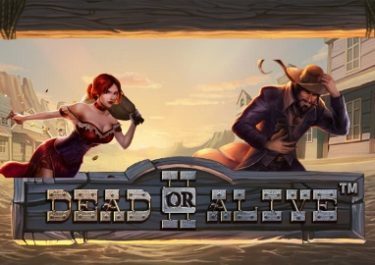 I can see the game becoming a player favorite, especially for punters who like to play slots but also betting on horse races.